Inexplicata-The Journal of Hispanic Ufology: Mexico: Balloons Against the Moon, or UFOs? Ana Luisa Cid writes: "I've had some free time for skygazing in the month of February. I recorded several objects, seemingly spherical, in the afternoon of [February] the 3rd. "As I've said before, the considerable distance that separates us from these objects does not allow us to determine their nature with any certainty. 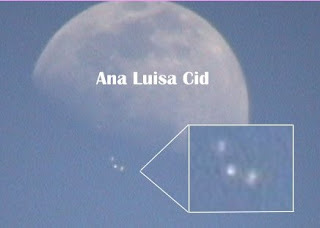 However, I think they may be UFOs (because we do not know what they are) or perhaps balloons (tied together in a bunch)"